The outbreak of avian influenza and its subsequent prevalence among birds, primarily in the North America region, has led to an intense egg supply crisis. Poultry producers across several countries, primarily in North America, are witnessing huge losses in the wake of a highly pathogenic strain of avian influenza. This epidemic has, in turn, persuaded producers to cull millions of chickens and turkeys. Consequently, food manufacturers are on the lookout for egg substitutes to include in various products, which is foreseen to bode well for egg replacement ingredients market. Moreover, this shortage could lead to increase in prices of eggs, encouraging producers and consumers to opt for egg substitutes at an affordable deal. Due to supply constraints, the prices of eggs in regions like North America could witness a drastic surge. Thus, multiple producers are vying for cutting down recipe costs by using egg substitutes, thereby propelling the growth of egg replacement ingredients market. Though a huge demographic of players in the bakery industry provide traditional bakery offerings, only a few players make use of egg replacement ingredients in their products. Health-savvy population evolving across the globe are highly preferring functional foods with natural ingredients. This is a preeminent trend creating pioneering opportunities for companies in egg replacement ingredients market to offer products in line with this growing fad. 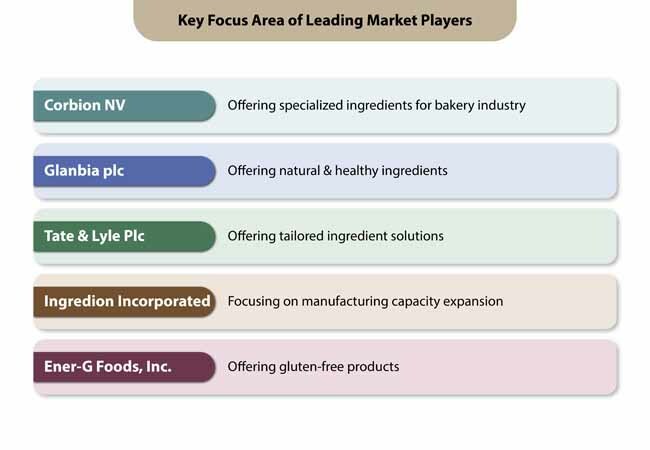 This opens up multiple avenues for domestic and local players to penetrate into the egg replacement ingredients market for cashing on surging demand for foods which are gluten-free, armed with a high nutritional profile, and are clean labelled from bakeries and several other food joints. This is envisioned to fortify the demand for egg replacement ingredients by a large margin. 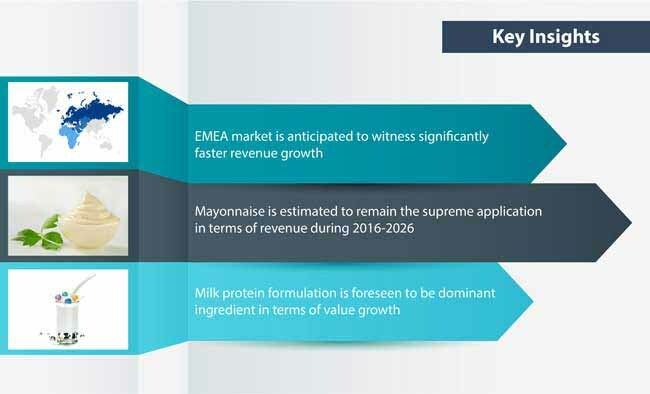 Mayonnaise is poised to stay ahead of the curve in terms of revenue in egg replacement ingredients market as compared to other application segments such as chocolates, biscuits and cookies, cakes/pastries/muffins/breads, and noodles & pasta in the egg replacement ingredients market. On the flip side, the section of cakes/ pastries/muffins/breads in egg replacement ingredients market is foreseen to exhibit faster growth over the forecast period. In the light of sudden and unprecedented decline in egg supply because of avian flu, several manufacturers of mayonnaise dressings have been receiving requests for introducing stabilizers to replace eggs in mayonnaise. Though manufacturers in egg replacement ingredients market find it a bit challenging to restore the functionality of eggs in mayonnaise-type dressings, they are persistently formulating stabilizer systems for replacing the necessary texture and emulsification properties. This, in turn, is poised to spur the demand for egg replacement ingredients and bode well for the overall market growth. To attain more information on various factors underpinning the market growth, request a free sample copy. Fact MR compiled a comprehensive report on egg replacement ingredients market for the assessment period of 2018–2028. The report on egg replacement ingredients is an ideal solution for both qualitative and quantitative intelligence, which are important for gauging overall scope of the egg replacement ingredients industry. Furthermore, the report on egg replacement ingredients market also covers exhaustive information of the current scenario of the industry, which forms a base for framing the futuristic anticipations. The report is an all-inclusive presentation of growth drivers, market restraints, prime opportunities, demand generators, market size estimations, industry forecasts, and pioneering trends governing the egg replacement ingredients market over the forecast timeline. The report on egg replacement ingredients market has been compiled by procuring information from both primary and secondary research findings. Porter's five forces model included in the report provides an overview of the competitive intensity, supplier, and buyer positions in the egg replacement ingredients market. Moreover, it also sheds light on the opportunities for new entrants in the egg replacement ingredients market. 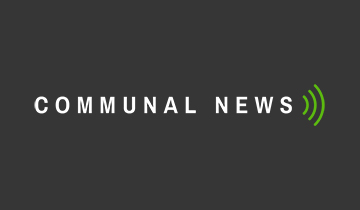 Further, the growth matrix entailed in the report gives a clear outline of the investment areas, which both the established and new market players should consider. 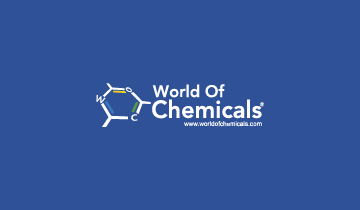 From the geographical standpoint, this report scrutinizes the top consumers, producers, production, product capability, consumption matrix, market share, and pervasive trends in the egg replacement ingredients market. The report starts with an industry overview of global egg replacement ingredients market, which is followed by a circumstantial analysis of the industry dynamics. The impact of key growth determinants and impediments have been studied in the report which are poised to thwart market growth of egg replacement ingredients over the time. A weighted average model is included that elaborates on the impact analysis of key growth drivers and determinants on egg replacement ingredients market to help the reader in making viable business decisions. Moreover, the egg replacement ingredients market is analyzed based on various segments to outline a comprehensive industry outlook for the respective assessment timeline. Apart from the global trends, the report on egg replacement ingredients market also discusses the key regional trends that are contributing to the market growth and also analyzes their after-effects on the industry of egg replacement ingredients. Egg replacement ingredients enable restoration of nutrients and helps reducing egg content in foods, without influencing the taste and appeal of the final product. It finds primary application in confectionary and bakery products such as cakes, muffins, mayonnaise, chocolates, custard, ice-cream, cookies and others. Egg replacement ingredients are foreseen to evolve as mainstream ingredients, primarily for use in bakery products by virtue of benefits such as reduction in count of raw materials used, enhanced appeal & texture, magnified shelf life and enticing taste. Going forward, egg replacement ingredients are expected to be widely adopted by various food manufacturers and end consumers. What additional benefits the market is attaining in the light of increasing consumer awareness towards preventive healthcare? How is complicated egg handling and production process pushing growth of egg replacement ingredients market? What kind of hindrances in the egg replacement ingredients market may result owing to increased cost of the final product? How is the increased demand for vegan or vegetable edible products influencing growth of egg replacement ingredients market? What strategies are companies operating in the industry of egg replacement industry adopting to gain competitive advantage over their rivals? To figure out the answers coupled with exhaustive information on other pivotal aspects of egg replacement ingredients market, request a free sample copy. The report further elaborates on the market taxonomy of egg replacement ingredients on the basis of several segments such as form, application, ingredient, end-user, and region. Egg replacement ingredients are further classified into liquid and powder, on the basis of form. Various application areas making use of egg replacement ingredients include chocolate, biscuits & cookies, cakes/ pastries/ muffins/bread, noodles & pasta, and mayonnaise. By ingredient, the types included in egg replacement ingredients market are milk protein formulations, algal flour, proteins, starch, soy products, and others. Types of end users involved in the egg replacement ingredients industry are commercial and household. 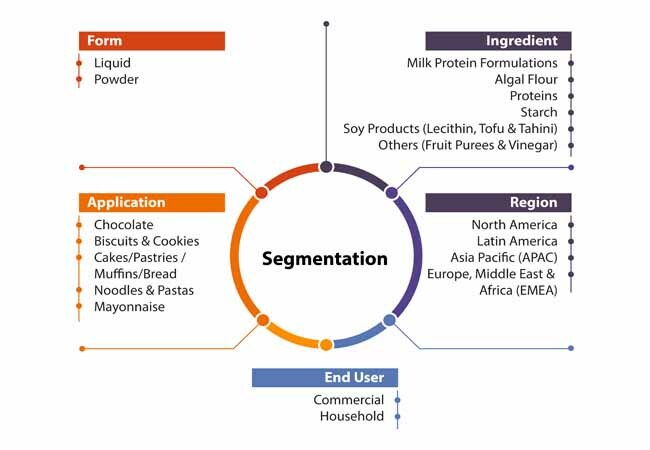 The market of egg replacement ingredients has been analyzed across several regions such as North America, Latin America, Asia Pacific (APAC), and Europe, Middle East & Africa (EMEA). The report on egg replacement ingredients market entails details of each segment, the historic data, current rationalities, and futuristic projections. For the entire taxonomy, request a free sample copy. The report entails a list of top-notch and well-established players operating in the egg replacement ingredients market. Those players of egg replacement ingredients market are featured on the basis of several factors such as their market reach, revenue shares, product developments, and many more. Few of the prominent players featured in the competitive dashboard of the report include Corbion NV, Glanbia plc, Tate & Lyle Plc, Ingredion Incorporated, and Ener-G Foods, Inc. Furthermore, the key focus areas of those companies operating in egg ingredients market have also been included for readers to gain a competitive edge. Also, product innovation and strategic moves of those prominent players operating in egg ingredients market have been included to aid the budding market players to upgrade their business strategies. The report on egg replacement ingredients market addresses each of the segment in detail, the historic data, current rationalities, and futuristic anticipations. Sub-segments under each category have also been discusses and elaborated. This market research study on egg replacement ingredients has been meticulously compiled by a series of practical intelligence collected from both secondary and primary sources. The data points included in the report on egg replacement ingredients market have been obtained through several interviews with key industry leaders from both demand and supply side, channel players, regulators, and standardization authorities. While compiling the secondary research data for this report on egg replacement ingredients, Fact.MR has conducted a rigorous search of relevant published repositories, which include annual reports, SEC filings, investor presentations, relevant magazines, associations, paid databases, and other available sources for egg replacement ingredients market. A key element incorporated in the research methodology of egg replacement ingredients is the primary data collection which involves direct discussions and interactions with a panel of key opinion leaders throughout the value chain. 11.4.3. Tate & Lyle Plc.